The Manchester Tiara was made by Cartier, Paris, in 1903 to the order of Consuelo, Dowager Duchess of Manchester. Cartier’s records note that she supplied over a thousand brilliant-cut diamonds and more than 400 rose-cut diamonds, while Cartier supplied further rose-cut diamonds and the paste stones which make up the scrolls at the end of each side. 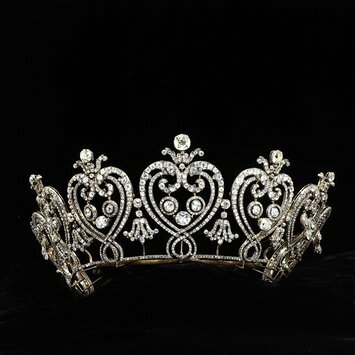 This tiara of graduated flaming hearts and C scrolls was inspired by a vision of France before the Revolution. Louis Cartier encouraged his designers to sketch 18th-century ironwork and architectural ornament in Paris and Versailles, and to study engraved jewellery designs. Consuelo, Duchess of Manchester (1858-1909), was the daughter of Antonio Yznaga del Valle, of Ravenswood, Louisiana, New York and Cuba. Consuelo was taken by her mother to Paris where her American friends included Jennie Jerome, later to be the mother of Winston Churchill and Alva Smith, later to be Alva Vanderbilt. Consuelo married George Victor Drogo Montagu, Viscount Mandeville, the future 8th Duke of Manchester, in 1876. The Duke of Portland recorded that she ‘took Society completely by storm by her beauty, wit and vivacity and it was soon at her very pretty feet’. She became a friend of Queen Alexandra to whom she bequeathed a bracelet on her death in 1909. A letter to the Times described her as ‘one of the first of the American ladies who married into the great English families, and who brought to this country that rare combination of high intelligence, a sunny nature and uncommon personal charm’. Diamond tiara composed of seven graduated heart-shaped openwork motifs with 'C' scroll ends, with detachable collet and scroll surmounts, each centre suspending three diamond drops. The smallest heart motif and the 'C' scrolls at each end are set with paste, except the three collet diamonds at the centre of each heart and their two outer borders. 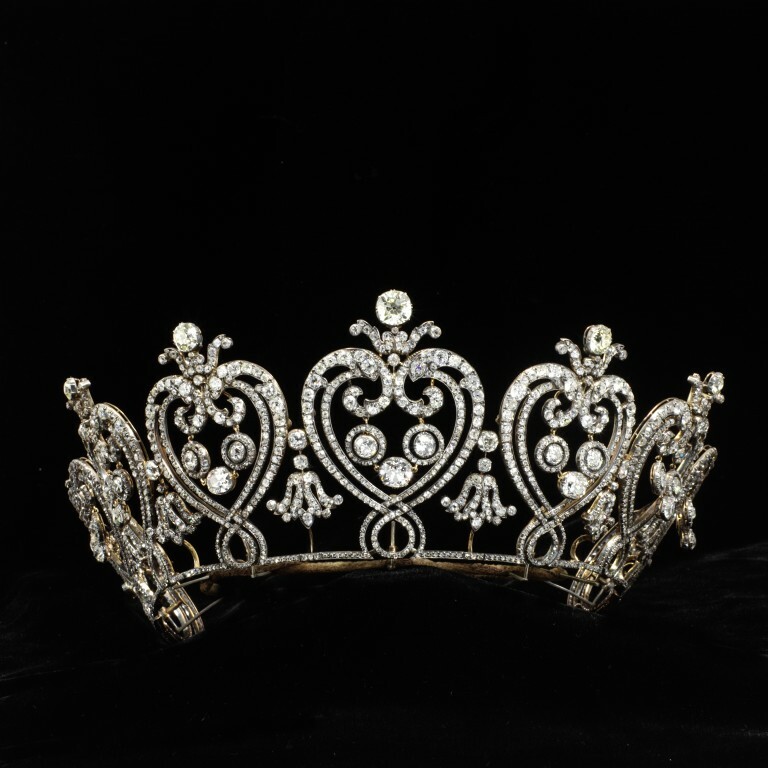 The tiara was commissioned by Consuelo, Dowager Duchess of Manchester, in 1903 from Cartier, Paris, primarily using diamonds which she had supplied. 'The Manchester Tiara', gold and silver set with diamonds and pastes (glass). Cartier, Paris, 1903.